Dyslexia is the most common learning disability among children. Students and adults with dyslexia have difficulty with reading, writing and memory. It affects from three to six percent of the population. 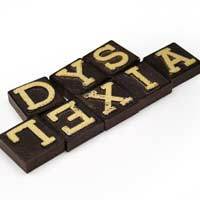 Dyslexia is an intriguing condition because it occurs among children of normal intelligence. Rather than a physical disability, dyslexia results from a persistent information processing malfunction in the brain. If dyslexia is identified early, prognosis is good for improved reading and writing skills. No specific cause of dyslexia has been identified. "Primary" dyslexia is hereditary and occurs more frequently in boys than in girls. The condition does not change with age. The reading skills of individuals with primary dyslexia normally peak at about level four. "Secondary" (or developmental) dyslexia appears to be caused by altered hormone levels during foetal development. "Trauma" dyslexia results from trauma or injury to the brain, but almost never occurs today. Dyslexia often goes undetected during the early years of school. It may be disguised by the frustration, low self esteem and even depression that dyslexic children frequently experience. The children have perfectly normal to high intelligence levels and their eyes and ears function normally. Yet their brain is unable to correctly process written or auditory information. Any child with normal intelligence but reading at least one-and-a-half levels below expected proficiency should be tested for dyslexia. This condition can also make itself known through impaired writing ability. Short words are often misspelled, letters are written out of order, and writing overall appears sloppy and misshapen. Teachers frequently assume the child has some sort of intellectual impairment. Once the student's intelligence becomes evident, the teacher then assumes the student is simply lazy. In reality, their impaired writing skills may result from dyslexia. Dyslexia also affects memory in different ways. People with dyslexia actually have very good long-term memory, especially for experiences, locations and faces. However, their memory is worse than normal for sequences, facts and any information that is not experienced. Some educators have seen promising results by teaching various memory strategies. So how can you find out definitively if your child has dyslexia? There are several indications that may help you decide whether or not to seek additional help. Children with dyslexia often experience confusion when using directional words, like in and out, or up and down. Sequences can be particularly challenging, like days of the week or counting. Since dyslexia tends to be heredity, examine your family tree for other instances of reading difficulties. Also, a dyslexic child will often surprise you at other times with their intelligence and alertness. Once a diagnosis of dyslexia has been confirmed, it is important to modify teaching strategies. Dyslexia is highly resistant to traditional methods of teaching. The most effective educational methods utilise counselling and recent advances in technology. Dyslexic students may need to record audio versions of instruction rather than taking notes. Text-to-speech systems on computers have also improved information retention. A team should be assembled at school to monitor progress and adjust instruction as necessary. Although dyslexia is a life-long condition, many obstacles can be overcome when it is identified early. Even higher reading and writing performance levels can be achieved with supportive family and friends.